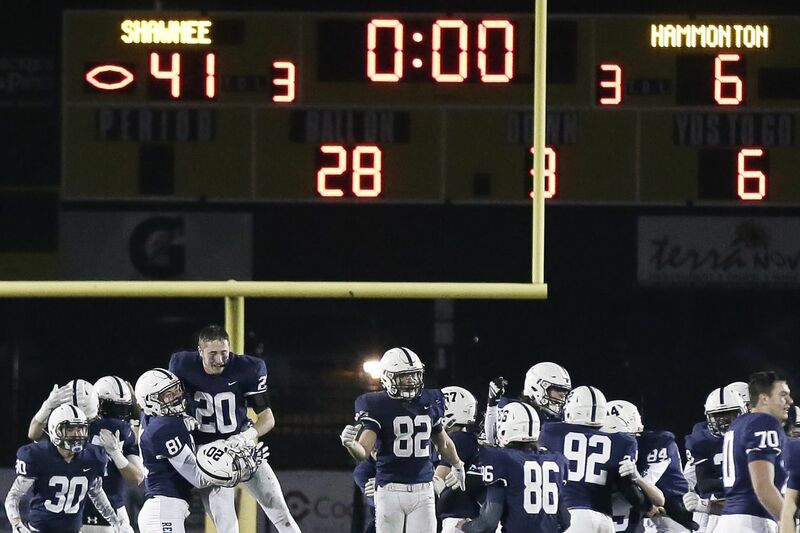 Shawnee football players celebrate after beating Hammonton last year to capture the South Jersey Group 4 title. No. 22 Cherokee (0-0) at No. 8 Shawnee (0-0): This is a traditional opener for both of these powerful programs. It's also a WJFL American Division game. Shawnee is the defending South Jersey Group 4 champion. The Renegades should have a sturdy defense featuring Bucknell recruit Jon Searcy, a top OLB, and a strong offensive line led by returning starters J.C. Dobis (below, in video) and Beau Lanzidelle. Senior all-purpose standout Joe Dalsey, who will wear the iconic No. 44 jersey this season, will start at quarterback for Shawnee. Cherokee will be playing its first game under new coach Brian Glatz, a former standout for the Chiefs as well as a long-time assistant coach. Glatz is just the fourth coach in the history of the Cherokee program, which was started in the mid-1970s by the legendary Jim Horner. Junior RB E.J. Bard and junior all-purpose Jackson McIntyre are players to watch for the Chiefs. No. 5 Haddonfield (1-0) at Sterling (1-0): These old rivals split last season, with Sterling winning in the regular season and Haddonfield turning the tables six days later in the first round of the South Jersey Group 2 tournament. Haddonfield is coming off an opening-night win over Pleasantville. Senior Drew Gavranich, the hero of last year's S.J. 2 title-game victory, scored twice in odd ways, recovering a blocked punt in the end zone and returning an interception for a touchdown. Senior RB Chris Brown, who missed last season with an injury, ran for 90 yards and looked sharp. Haddonfield’s Drew Gavranich (right) scored the winning TD in last year’s South Jersey Group 2 title game. Sterling handled Triton in the opener as senior all-purpose Nick Harmer ran for one score, caught a pass for another, and kicked a pair of extra points. No. 4 Williamstown (1-0) at No. 10 Rancocas Valley (1-0): This clash of Group 5 powers has major WJFL American and playoff implications. The Braves beat Vineland, another Group 5 contender, in their opener. Senior QB J.C. Collins (below, in video), a UMass recruit, led the way as the Braves outscored the Clan by 17-0 in the fourth. Williamstown got a scare when senior all-purpose Wade Inge Jr., a Delaware State recruit, went down with an injury, but coach Frank Fucetola said Inge should be OK.
RV, last season's S.J. 5 finalist, overwhelmed rebuilding Camden Catholic in the opener. Senior WR Danny Kondras had quite a day: two punt returns for TDs, plus a TD catch. Senior QB Bryce Mangene threw two scoring passes. No. 16 Cedar Creek (1-0) at No. 9 Camden (0-1): These teams have history, with Camden holding the upper hand in a brief but spirited rivalry. The host Panthers lost their opener at Wise (Md. ), the three-time Maryland 4A state champion. Senior QB Monte Williams threw a TD pass to sophomore Corey Palmer, a young player to watch. Camden's sturdy defense will face a challenge in this WJFL Constitution Division battle from Cedar Creek junior QB Louis Barrios, junior all-purpose Malachi Melton, and senior RB Kamaal Reed. The Pirates rallied to beat Willingboro in overtime in the opener. No. 15 Holy Spirit (0-1) at Eastern (0-0): This clash of unfamiliar foes is a WJFL Royal game, as that division has been completely revamped. These two teams might be the top contenders. Holy Spirit lost to Maryland non-public power Mt. St. Joseph in the opener. Senior QB Ryan Yost ran for a score and passed for another. Junior RB Eli'jah Gray is a dynamic player for the Spartans. Holy Spirit’s Eli’jah Gray ran for 22 TDs as a sophomore for the Spartans. Eastern is looking to take another step under second-year coach John Doherty. The Vikings have a top lineman in Temple recruit Jermaine Donaldson and should get a boost from four transfers from Camden Catholic, including Monmouth recruit Dante Kiett. No. 18 Moorestown (0-0) at Winslow Twp. (0-1): This WJFL Liberty game features a matchup of two of South Jersey's top senior quarterbacks: the Quakers' Brian McMonagle and the Eagles' Prince dru-Bey. McMonagle, a three-sport star who is a Boston College recruit for baseball, is part of a veteran Moorestown team that includes standout seniors such as LBs Josh Pearcy and Jack Ginley and all-purpose Nick Cartwright-Atkins. Winslow Twp. is coming off a loss to No. 6 Woodrow Wilson in the opener as dru-Bey threw a pair of TD passes. The Eagles have a top all-purpose player in senior Donovan Bunch, a Rutgers recruit as a defensive back. Winslow Twp.’s Donovan Bunch is a Rutgers recruit. Kingsway (0-1) at Washington Twp. (0-0): This WJFL Royal game will mark the debut of Minutemen coach Mike Schatzman, a former standout football and baseball player at the school as well as assistant coach. Schatzman will look to dip into Washington Twp. 's rich tradition to bring the once-proud program back to prominence. His first team features a top all-purpose player in senior Joe McKillop. Kingsway is coming off a loss to Highland in the opener. Dennis Lee returned a punt for a TD for the Dragons. Paul VI (0-1) at No. 14 Burlington Twp. (0-0): The host Falcons loom as strong contenders in both the WJFL Liberty and the Group 3 playoff race. Burlington Twp. features a top all-purpose player in senior Omar Rogers, and the Falcons should get a boost from six transfers from Camden Catholic, including brothers Terron and Tyrese Ware, top lineman Nick Morcombe and junior RB Rodney Vines. Paul VI is coming off a loss to Pennsauken in the opener. Osamai Unuigbe caught a TD pass. The Eagles likely will be without senior RB Brian Brown, who scored a TD vs. Pennsauken, for a few weeks because of a broken collarbone. No. 17 West Deptford (0-1) vs. Collingswood (1-0) at Haddon Twp., 11 a.m.: Collingswood is playing home games at Haddon Township while work is done on its historic stadium. The host Panthers won coach Mike McKeown's debut, beating Audubon, 27-14, Thursday as Jaquan Paige ran for two scores and Michael Jenkins scored on a 75-yard pass from Andrew Clark and on a 77-yard kickoff return. Junior RB Tyshawn Bookman (No. 27) is a player to watch for West Deptford. West Deptford lost a tough opener to rival Paulsboro in the debut of coach Jason Morrell. Junior RB Tyshawn Bookman is a player to watch for the Eagles, who will be urgent to avoid falling to 0-2 with No. 3 Delsea set to visit West Deptford on Sept. 14. No. 11 Millville (0-1) at No. 1 St. Joseph (1-0), noon: This WJFL Continental clash marks another daunting challenge for the visiting Thunderbolts. Millville opened last week with a loss to St. Peter's Prep, a North Jersey non-public power. Now the Thunderbolts face a South Jersey non-public power in St. Joseph. Is there a public school in the state with a tougher opening slate? Millville has a player to watch in junior Solomon DeShields, a WR/OLB who has offers from Rutgers and Michigan State. DeShields scored on a TD catch vs. St. Peter's Prep. St. Joseph has won 13 in a row. The Wildcats have dominant front lines led by senior Wisdom Quarshie (above, in video), a Temple recruit. St. Joseph opened with a big win vs. Hamden Hall (Conn.) Saturday at the University of New Haven as junior Jada Byers scored six TDs and sophomore QB Jayden Shertel, making his starting debut, threw a TD pass to Nate Johnson.